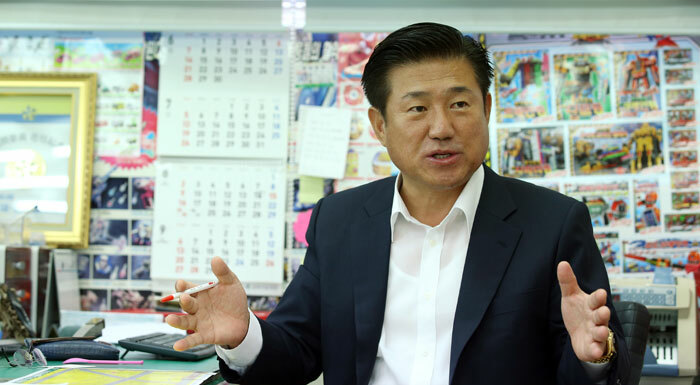 About 100 shops are located in the Stationery and Toys Wholesale Market near the Dongdaemun market district. Visitors can find a variety of toys there. Many of the shops open early in the morning to get ready for shoppers. Toys line the shelves, tumbling into the street displays, each different in shape and color. They capture the eyes of passers-by with their playful melodies and colorful lights. Here, you can find toys of all kinds: the Stationery and Toys Wholesale Market near the market district of Dongdaemun, close to the Heunginjimun Gate. The history of the market traces back to the 1960s. The market formed when stationery shops and toy shops began to gather near the station. 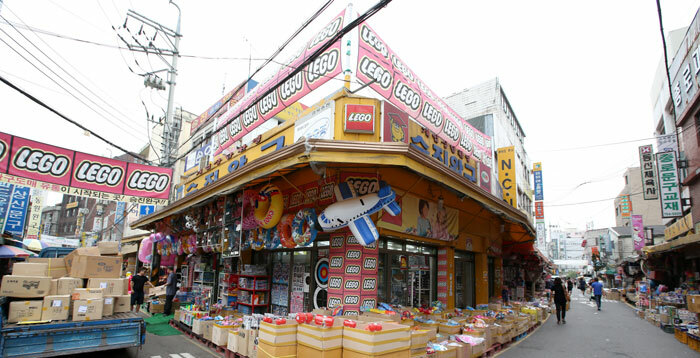 Today, about 100 shops that sell either stationery or toys are found along the street. Approximately 12,000 people, including international tourists, visit the market every day. A banner announces the entrance to the Stationery and Toys Wholesale Market. This market has been well known since the 1960s. Many of these shops open early in the morning to receive products delivered from everywhere in or outside the country, and to get ready for the day’s visitors. It is common in the streets there to spot children nagging and begging their parents to buy them a toy. The market is particularly packed with customers around special holidays, such as Christmas or Children’s Day. 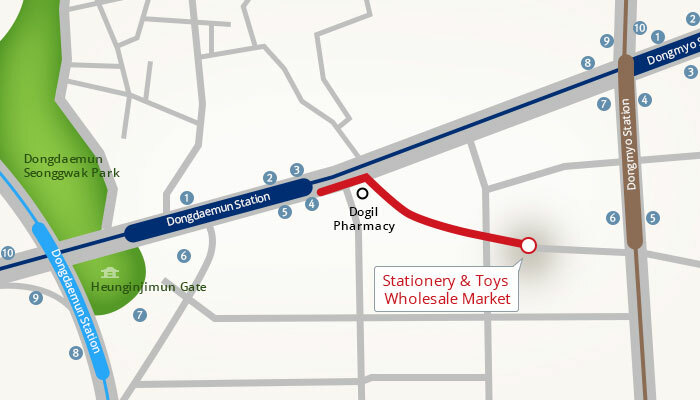 You can also find all sorts of stationery goods, as well as toys, in the market. Ranging from writing materials such as pencils, pencil cases, notebooks and ball-point pens to art supplies like brushes, paints and sketchbooks and even study materials: all types of stationery goods are for sale. Most of them can be bought here cheaper than elsewhere in the city. Many students visit the market to purchase notebooks, pencils and other writing materials before starting a new semester or a new grade. 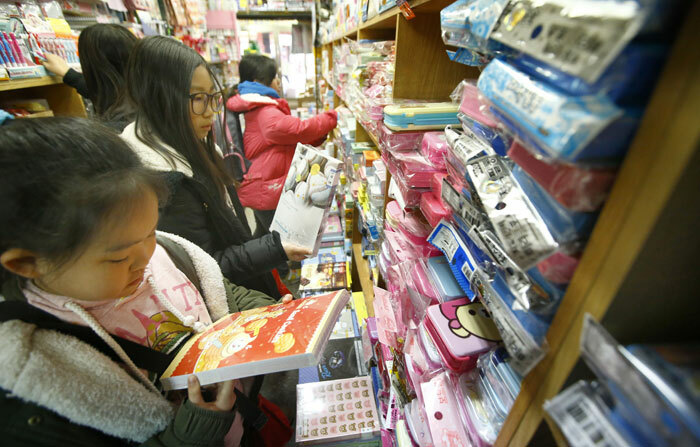 Young students peruse the stationery goods for sale at a shop in the Stationery and Toys Wholesale Market before starting a new semester or a new grade. “Retail shops have a limited stock squeezed onto a smaller floor space. 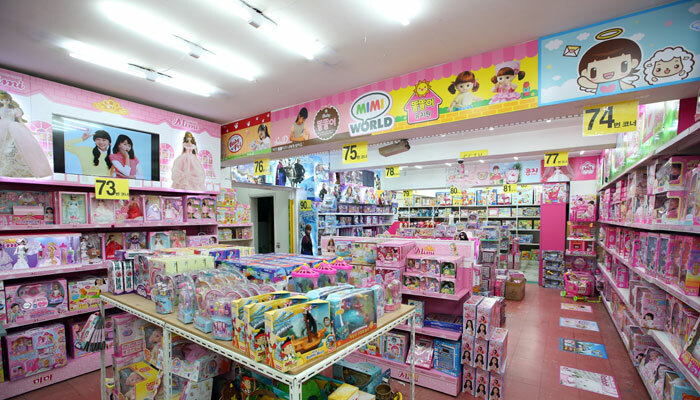 It would be impossible to find such a place as this elsewhere in the world, where you can find a large variety of toys all at one place. Only in Korea,” he says. Toy store owner Song says price and scale are some of the merits of the market. “This market impresses many non-Koreans. We have many international customers, including Chinese and Russian tourists,” he added. 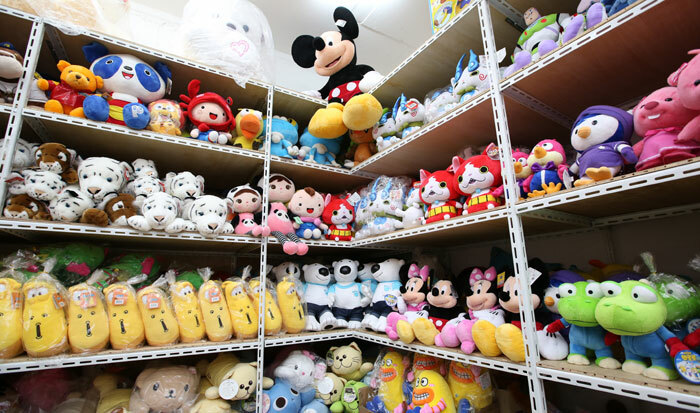 Customers can find a variety of toys all in one place and purchase them at a lower-than-retail price at the Stationery and Toys Wholesale Market in Seoul. “These days, most toys are cartoon characters,” he said. In fact, cartoon character toys such as Pororo the Little Penguin, Robocar Poli, and Tobot are popular among both Korean and non-Korean customers, and all show strong sales. “Unlike in the past, toys are no longer regarded as simply playthings. They are evolving into tools to help kids develop their creativity. 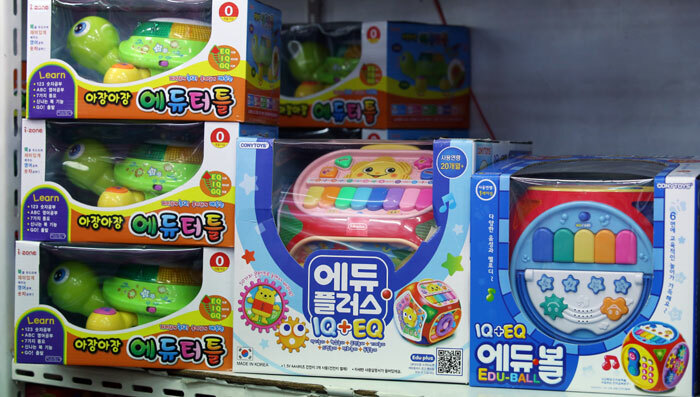 In this regard, Korean toy makers are good at developing products that can boost a child’s creativity,” said Song. Toys of all kinds, shapes and sizes, ranging from cartoon characters to dolls, cars and stuffed animals, wait for a happy shopper to take them home. The nearest subway station is Dongdaemun Station, where lines No. 1 and No. 4 meet. Depart through exit No. 4 and go straight for a few minutes. 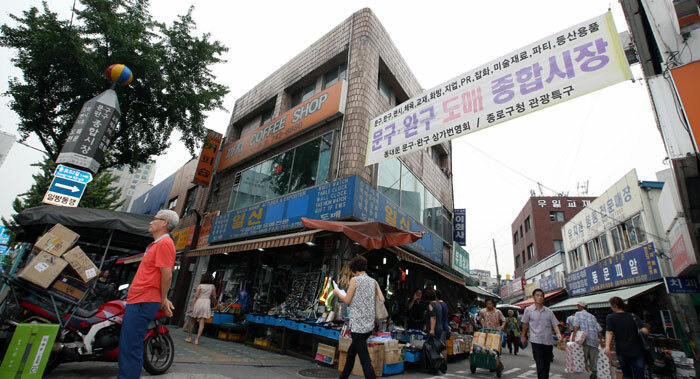 You’ll find an orange signboard for the Dogil Pharmacy (독일약국) or the market’s signpost. Turn right to find an alley where the market begins. When using subway line No. 6, get off at Dongmyo Station. Depart through exit No. 7 and walk about ten minutes to find the signpost or the orange signboard.